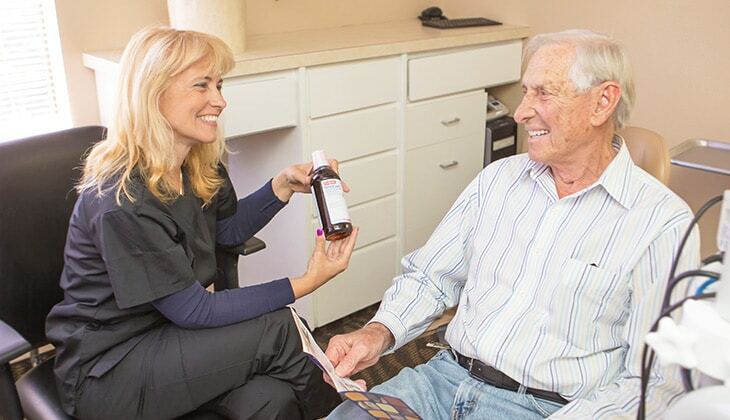 Cleanings for Dental Implants in Mission Viejo | Orange County Periodontists | Ajay B. Setya, DDS, MSD Robert C. Hirst, DDS, MS Christen S. Bergman, DDS., MS.
We will educate you on the proper cleaning of your dental implant. Dental implants can last a lifetime if adequately cleaned and cared for. But implants need special care in cleaning as they are not natural teeth. They need special tools and procedures to clean them correctly. Dr. Setya and our hygienists ensure that your implants are thoroughly and properly cleaned and their health is maintained after treatment. Same as with your natural teeth, routine cleanings are a must to remove the bacterial plaque that accumulates and to maintain the health of the gums and bone surrounding the implant. Dr. Setya recommends that you get your implants professionally cleaned every three or four months. He and our hygienists will tailor-make your cleaning schedule so your maintenance care is adequate to your needs. Bacterial plaque accumulates far easier and faster on rough or scratched surfaces, and our hygienists use special instruments made out of titanium or plastic that do not scratch or damage the implant surfaces when cleaning. It is equally important that you know how to clean your implants as part of your personal home oral care. Your hygienist will educate you on the proper tools and techniques for cleaning implants and will recommend the best oral care products to use as part of your hygiene maintenance appointments. You can even request a special appointment with one of our hygienists for thorough demonstration and detailed training in the use of these tools so your home care is maximally effective. Can complications develop with implants? red or swollen gums around an implant are evidence that there may be a problem with the implant. If the implant is placed correctly and it is taken care of adequately with effective hygiene maintenance, complications are rare. But there are factors that can sometimes cause problems to develop and any problems discovered should be treated immediately. Learn more about how we treat dental implant problems here.